This campaign yielded over $10,900 in donations for the cause, and its success was due in large part to the great efforts of Atlantic credit unions and their members, and supplemented with the fund-matching initiative carried out with Atlantic Central and League Savings and Mortgage Company. 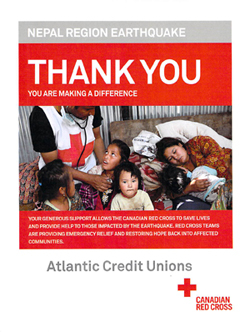 Donors are reminded that although the Atlantic Credit Unions’ campaign ended on May 31st, the Canadian Red Cross fund-raising efforts may continue for a while yet. Tax receipts may not be issued to donors by the Red Cross until their campaign has concluded. A big Thank You to all donors! – Compassion and Caring … just another part of the credit union difference!